I love Jules! She is so much fun! She's a top down selfie expert! She's one of my favorites to stalk on Snapchat (@teacherfashion) because she's so down to earth and sweet. And we both love our fur babies as if they were our own flesh and blood. One of these days I will make it out to Arizona to meet this girl in person! And I don't know about you, but *my* teachers didn't dress this well when I was in school! Or maybe they did and I just didn't appreciate it back then! Either way, I love following her fashion even though we are in two totally different fields of work! Let's see what she has in store for us today! Every week we all count down the days until Friday. I know I'm not alone, here! Fridays bring weekends, and weekends bring opportunities to unwind with a night out, dinner dates, brunch, movies or shopping, church, or other social events. 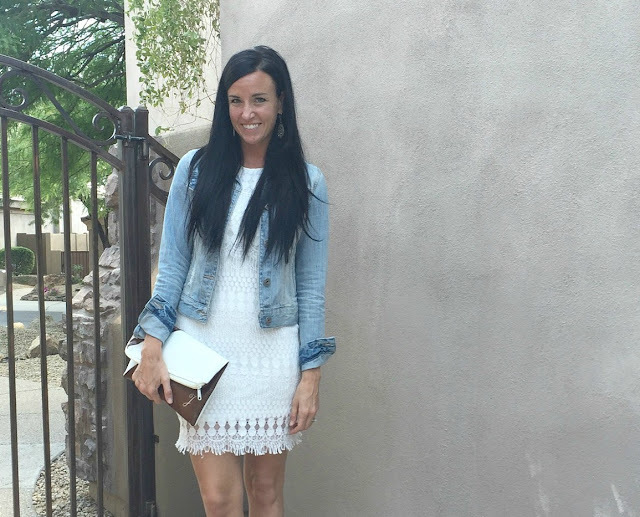 Today I put together a shabby chic denim-on-lace look. When I think dinner or an evening event, I always plan to have my denim jacket in hand. Not only does denim add a trendy feel to an outfit, but we all know you'll be glad you have it! ...Either the night air will get quite cool, or the air conditioning inside will make you nearly freeze! ​I love finding small boutiques or shops that sell unique and quality pieces. This clutch is just that! The material is vegan leather, and handmade by one of my Insta-friends at Ooh Baby Designs. She added a beautiful "J" monogram to mine, and does many custom touches like that. Check out her designs for clutches, teacher totes, beach bags, and gifts. This dress has the cutest loose-fitting sleeves, I just love the dainty look and how they match the hem line. The dress is fully lined (not the sleeves), although the lining does end 2-3 inches above the lace shell, which might make it feel short for some. I think a touch of denim can really take a polished look to a trendy shabby-chic level. The best part about that? You can wear this type of outfit anywhere! Have a fabulous day, all! Thank you for reading along with my guest post. 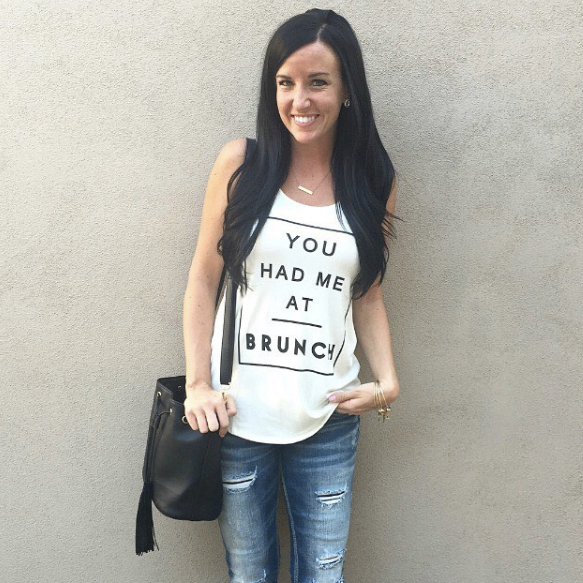 We follow Jules on IG and love her style! Thanks for introducing her! As always Jules looks flawless! Love this white lace dress on you, perfect pairing with a denim jacket! Gorgeous look!